A hot tub sales firm has been fined £1m following the deaths of two men from Legionnaires disease. Twenty others were also affected after a hot tub on display at JTF warehouse in Stoke-on-Trent exposed people to harmful levels of Legionella bacteria. Richard Griffin and William Hammersley, 79, from Chesterton, died in 2012. Harry Cadman, 71, from Stoke-on-Trent, died from a pre-exisiting condition. JTF admitted a health and safety breach at Stafford Crown Court on Friday. In a joint statement, relatives of the men criticised JTF for remaining "faceless throughout" and never apologising or showing compassion. "The past five years have been extremely difficult, we have had to endure years of not knowing who was responsible for the outbreak of Legionnaires' Disease at the JTF store in Fenton that had such tragic consequences for us all. "JTF have hid behind a wall of silence all these years before finally admitting that they were to blame, not only for infecting all those innocent people but to causing the premature deaths of our loved ones." The family of 64-year-old delivery driver Mr Griffin had already said he had never taken a day off in 30 years. 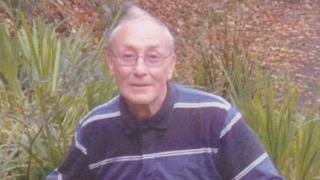 Although Mr Cadman did not die from Legionella bacteria, his quality of life was "severely impaired" by the disease before his death, the court heard. After the sentencing, JTF apologised "unreservedly" for its failings that had such "devastating consequences". It admitted failing to ensure the safety of employees and customers under the Health and Safety at Work Act. A report by the Health Protection Agency in 2012 said the hot tub was the probable source of the "significant" outbreak. Since the deaths, a new board of directors and senior management team had been appointed at the company, it said. "A rigorous and extensive review of the company's health and safety controls, management procedures and risk assessments has been completed."